The latest in Wedgwood’s series of land-use-planning Coffee Talks was held on Thursday evening, June 21, 2012, on the topic of Density and its Benefits. What is “density?” One definition is the number of people who live within a given land area. Another definition, from an architectural point of view, is the amount of land area used up by a building. 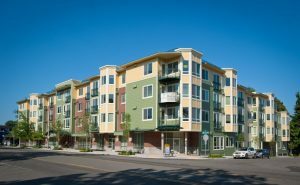 The Jasper Apartment building at 8606 35th Ave NE was completed July 2012. The new Jasper Apartments at 8606 35th Ave NE is considered dense by Wedgwood standards, because it is the first four-story building in the commercial heart of Wedgwood. It was not until the project was first proposed in 2007 (originally to be condos, now apartments) that Wedgwoodians were even aware that it was permissible to build a four-story building in Wedgwood. The Jasper building uses all of its land area and it has maximized its allowable height under Seattle’s zoning regulations. The total land area of the Jasper is three-quarters of an acre. With more than 90 apartments in the building, we know that the density will be more than 100 people per acre, perhaps approaching 200 or more depending upon how full the building is and how many people live in each apartment. This will make the Jasper the most population-dense area of Wedgwood. We know that using the maximum surface area and allowable height enables a building owner to obtain the maximum value of a building. As Wedgwood’s commercial buildings age and are replaced, we can expect to see more “Jaspers,” and some mini-Jaspers in zones which allow only three-story buildings, such as on 35th Ave NE at NE 75th Street. What will happen when Wedgwood becomes more “dense?” How will density affect the quality of life in Wedgwood? One of the potential benefits of density will be the influx of enthusiastic new community members. We can reach out to Jasper residents to get involved in community activities at schools, churches and volunteer groups. The greater variety of housing options represented by apartments and condos will bring in a greater variety of age groups, from young single adults to young families to older adults who are downsizing. Another potential benefit of greater density in Wedgwood is being able to get more of what we want from the City of Seattle. Current bus service is not as frequent or fast as we would like, but is more likely to improve as demand increases. As density increases, mitigation such as parks and open space, sidewalks, traffic calming measures, street trees and landscaping also increases. Wedgwoodians need to stay alert to planned projects and ask for benefits at the beginning of the process. As we learned when the condo project (now the Jasper) started, the community needs to have input in design planning. The speaker at Thursday evening’s discussion on density was Catherine Benotto of Weber Thompson Architects. Ms. Benotto is an urban planner whose studies of “housing intensification” have shown that big trees and good landscaping will attract people to any kind of housing type, as long as it is designed well. Along with good building design, the other most important factor in where families choose to live is proximity to quality schools and recreation. 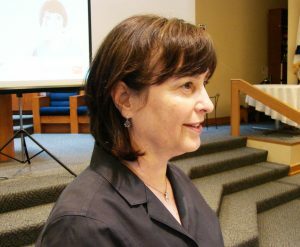 Ms. Benotto explained that there is presently a population boom of young adults who are choosing not to become single-family homeowners. People who are now in their twenties and thirties may not choose the traditional migration to the suburbs but may stay in the city to raise children in multi-family units like apartments and condos. Communities like Wedgwood, which has services including schools and a walkable commercial district, may attract young families to buildings like the Jasper. Yet another failure of a small business and yet another bank took its place in the neighborhood in 2012. Ms. Benotto serves on the Seattle Planning Commission, a volunteer board which advises the city on issues of land use, transportation, and neighborhood planning. According to Ms. Benotto, there is a relationship between having an adequate number of neighborhood residents (“density”) and the viability of local businesses. An interesting and varied retail district can only be sustained by a sufficient number of shoppers. In Wedgwood we have seen this rule illustrated by the repeated failure of small local businesses to “make it,” which has left Wedgwood with major chain stores and banks dominating the commercial district. 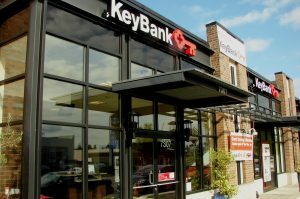 This year another small business failed, and KeyBank moved into the space, bringing the number of banks in the neighborhood to seven. ← Previous Previous post: What Should Be Done with Building 18 at Magnuson Park? Have a Say!